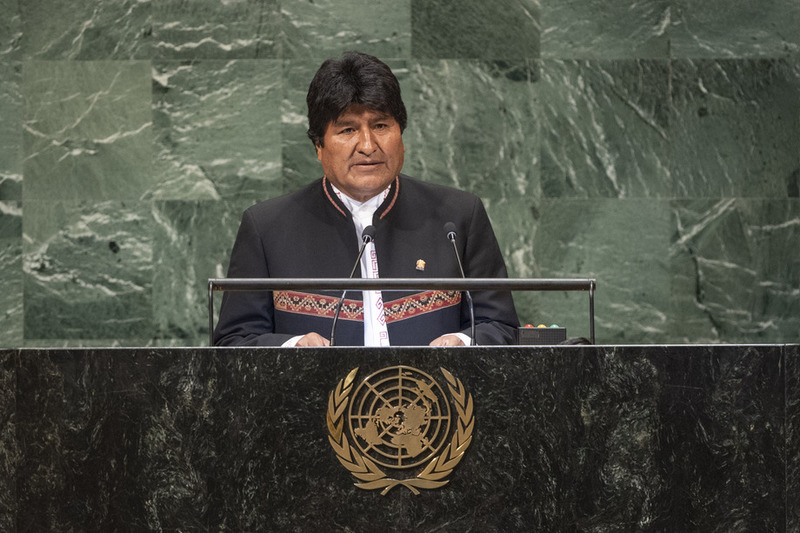 EVO MORALES AYMA, President of Bolivia, said that men, women and children in the world expect our debate here to have an outcome and results to improve their lives. Citing the theme of this year’s session — making the United Nations relevant to all people — he said we must resolve issues by peaceful means, referring to the case his country had sent to the International Court of Justice for Chile to negotiate with Bolivia for the sovereign access to the Pacific Ocean. The hemispheric importance of that dispute is recognized by the Organization of American States. Hoping to end the 100‑year‑old dispute between the neighbours, he noted the negative impact of having access denied to the Pacific Ocean. It has greatly affected its human development and denied its access to the huge resources of the sea. “A human being needs the sea, you cannot have life on land without water,” he said, calling it a window to other people and life itself and regretting that Bolivia is now landlocked. Unfortunately, we come together here every year, yet many of the crises are getting worse and more serious, he said. While referring to several major current challenges, he cited climate change, the arms race and a nuclear disaster, and inequality. Addressing climate change, he pointed out that each year is getting hotter than before, harsher phenomena are occurring, and more people are affected by hurricanes, droughts, flooding and pollution. Tackling the structural causes are essential. The largest polluter in history, the United States, has turned its back on science, and thus on humanity. Climate change is an inevitable result of capitalism. “The planet is being exhausted and life, too,” he said. On the arms race and a possible nuclear disaster, he noted many leaders concerned come here and talk about peace. Addressing the inequality of wealth, he deplored the fact that wealth is concentrated in fewer and fewer hands. He pointed out that half of the human population saw no increase in income. He said that this is a model for accumulating wealth and not for alleviating poverty. He also stressed that the United States must provide reparations to Cuba, lifting blockades and giving Guantanamo back to Cuba. On the People’s Alternative Revolutionary Force (FARC) and Colombia, he expressed his hope for that country in protecting the lives of those who defended human rights. Noting that Venezuela suffered aggression by the United States, he said that that South American nation should be able to solve their own problems. Condemning Israel’s criminal occupation of Palestinian territories, he reiterated his support for the two‑State solution. Furthermore, he expressed his deep regrets for the war in Syria costing the lives of more than half a million in the last 8 years, adding that Bolivia rejects violation of independence and integrity of territory, including by the United States. War is the result of policies of regime change and interfering in internal affairs. He thanked the Russian Federation, Iran, Turkey and Kazakhstan for their efforts to solve the crisis in Syria. Speaking of his own country, he noted that it got rid of United States military bases and the impositions of the International Monetary Fund (IMF). Furthermore, Bolivia reduced poverty from 37 per cent to 17 per cent, increased life expectancy and reduced child mortality by 56 per cent. He listed initiatives to combat corruption and put an end to banking secrecy, providing the greatest possible transparency. He confirmed Bolivia’s continued commitment to multilateralism, stressing that we must build a fairer and more just society for all. “We have only one planet. This is our home,” he stressed.